Let's continue onward through the fantastic second wave of the G.I. 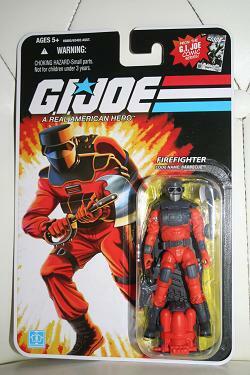 Joe Modern Era single carded figures, today taking a look at Barbecue! A party animal from Boston - what better place to have a fire fighter family? Much like Bazooka, Barbecue comes with some great accessories, including his tank system and axe - good stuff. As always, click the link above for more pictures and his excellent bio!